Mary Louise Schall Tapscott, 94, of Applewold, PA, passed away Sunday, February 10, 2019, at Concordia's Lund Care in Cabot. She was born September 2, 1924 in Whitesburg, Armstrong Co., PA, to Orville B. and Hazel (George) Elder. Mary grew up in Whitesburg and attended Whitesburg United Methodist Church. Mary made the long commute to Kittanning High School to complete her education. She married Dawson H. Schall in Quonset Point, RI at the end of World War II, where Dawson served as a Seabee. Mary worked at the Armstrong County Courthouse for 20 years until retiring in 1986, and formerly was employed at the telephone company and the American Heart Association. She was a member of the Kittanning Eastern Star for over 50 years and enjoyed reading, dancing, horses and boating on the Allegheny. Mary spent many winters in Okeechobee, Florida. She loved traveling and had fond memories of her trip to Alaska. Mary's family is thankful for the superior care she received at the River Cliff facilities in Kittanning and Concordia Lutheran Ministries in Cabot. 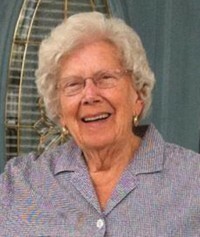 Her memory will be cherished by her daughters, Susan Schall Gordon and husband, Clyde, of Mystic, CT, and Nancy Schall Smith and husband, Joseph, of Kittanning; grandchildren, Geoffrey Gordon and wife, Valerie, Daniel Gordon and wife, Katie, Tabitha Gordon, and David Martin and wife, Caitlin; great-grandchildren, Sadie, Tate and Kai Gordon, Elloise Gordon, Kendall and Colbie Claus, and Simone Martin, as well as an expected eighth great-grandchild; sister-in-law, Mary Elder of Cabot; step-children, Mark Tapscott and wife ,Teri, of Mechanicsville, VA, Gail Mitchell and husband, Ernest, of Amherst, VA, and Carol Merritt of Mechanicsville, VA; five step-grandchildren; ten step-great-grandchildren; and a dear friend, Susan Torrance. She was preceded in death by her parents; first husband, Dawson H. Schall; second husband, Harold Tapscott; brothers, Bernard and Donald Elder; and longtime friend, Ray Kinnard. A Celebration of Life Service will be held at 2 p.m. on Saturday, February 16, 2019, in the chapel at Haven I Concordia, 134 Marwood Road, Cabot, PA 16023. A private interment was held at Whitesburg United Methodist Cemetery, Kittanning, PA. Contributions can be made in Mary's honor to Concordia's Good Samaritan Endowment Fund, 134 Marwood Road, Cabot, PA 16023; checks made payable to Concordia Lutheran Ministries.